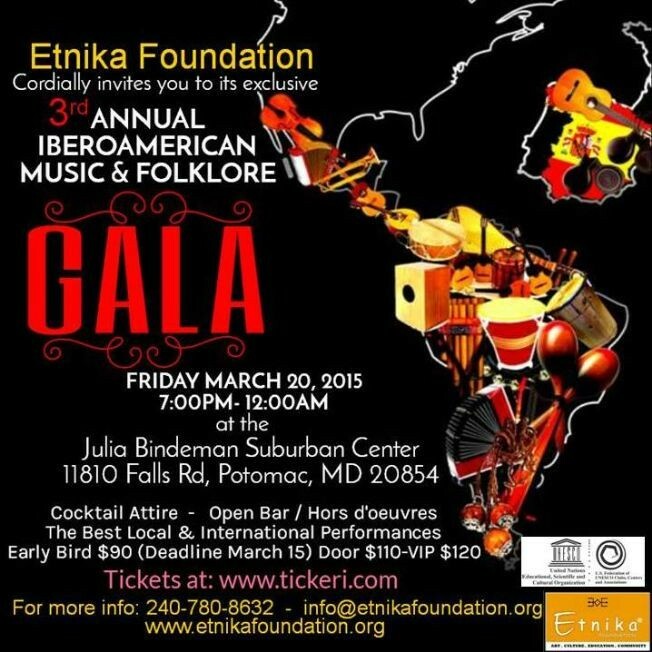 JOIN ETNIKA FOUNDATION TO CELEBRATE THEIR THIRD ANNUAL MUSIC & FOLKLORE GALA, Friday March 20, 2015 at the exclusive Julia Bindeman Hebrew Suburban Center in Potomac Maryland. - 7:00-8:00PM: IBEROAMERICAN ART THEME SILENT AUCTION. - 8:00-10:30PM: PROGRAM (Live music and dance performances from local, national and international groups), OPEN BAR BY EXPERT MIXOLOGISTS & OPEN FOOD BY 10 CHEFS. - 10:30PM-12:00AM: OPEN DANCE FLOOR. Etnika Foundation is an US based non-profit organization endorse by the US Federation of UNESCO Clubs and Associations with the mission of promoting and integrating Latin American art, traditions, folklore and culture to other ethnic groups around the world. Etnika Foundation has been hosting and promoting Latin American Folklore for over 2 years. This time, their 3rd Gala will take place in Montgomery County Maryland, adding Spain to its event called the IBEROAMERICAN MUSIC & FOLKLORE GALA on Friday March 20, 2015 from 7:00pm-12:00am at the prestigious Julia Bindeman Hebrew Center in Potomac, Maryland. The proceeds will go to our after school program called DanceVersity where children from Pre-K to 10 years old will be able to discover other cultures while learning how to play their music and dances. With this program we will improve their self-esteem, skills, talent, as well as fight obesity and depression. We strongly believe that promoting multicultural arts not just will keep children occupied while enriching their lives with dance and music, but we will promote respect and acceptance of other cultures in an everyday more diverse environment.